Before you take your child boating or swimming in open water, it’s important to choose the right personal flotation device, or PFD. With children, there are more considerations than for an adult, such as fit, style, and the child’s swimming ability. There are several different grades of PFDs, ranging from Type I to Type V, with the higher numbers designed for calmer waters and where rescues will occur quickly. 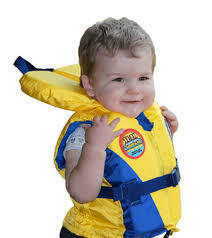 It is recommended that children use either a Type I or a Type II PFD. Whether you choose a Type I or Type II vest generally depends on the type of water you will experience. For calm waters close to rescue sources, Type II may be sufficient. For rough, isolated waters, a Type I is safer. Type II PFDs are also called near-shore buoyancy vests. They are designed for calm, open waters where rescue will occur quickly. They will generally, but not always, turn an unconscious wearer face-up. They are not designed for rough water or long periods. They are less bulky than Type I vests, and are usually less expensive than any of the types. A Type I PFD, also known as an offshore life jacket, provides the most buoyancy of all PFD types, making it suitable for any water conditions. This includes rough water or situations where rescue might be delayed. ALthough they are bulky, they will turn most unconscious swimmers face-up. Just as with an adult, the child must try on the PFD before you buy it. The PFD must have a snug fit to work correctly. Buckle the child into the PFD, then pick up the child using the shoulders of the PFD. If it fits correctly, the child’s ears and chin will not slip through the opening. This is especially important because children are more likely to panic if they fall into the water unexpectedly. This will make them thrash their arms and legs around, which makes it harder for them to float, even in a PFD. If this happens while wearing a PFD that is too loose, it can trap their arms over their heads, forcing their head underwater. In addition, children have a different weight distribution from adults, which makes them float differently. 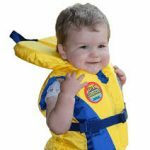 While the wrong, or poorly fitting, PFD may keep the child floating, it may not help them float face-up. This is why it’s so important to make sure the PFD fits correctly, as well as teaching your child the reason for wearing it. Every child, even ones who are skilled swimmers, should wear a PFD anytime they’re on a boat in the water. In fact, it’s the law for many states. If your child is not used to wearing a PFD, try it out in shallow water or a swimming pool. This helps them get comfortable with the fit and the performance, and it gives you the confidence that the PFD fits and functions correctly. However, PFDs will not replace parental supervision. A parent or responsible adult must always supervise children when they are in or near the water. If there are a group of adults, make sure that one or two specific people are assigned to watch the children. Tragedy can happen, even with several adults present, because everyone assumes “someone else” is watching. Also, never substitute non-approved devices, such as rafts or inflatable toys, for a PFD. They are not designed as life-saving devices and are not reliable in an emergency.